There are approximately 750 light switches in my house. So, there are plenty of switches, but the problem I’m having is where they were placed. I’m not an architect or a fancy electrical switch placement designer or anything, but I do have common sense. The fancy electrical switch placement designer that did our house must have been having an off day. Our staircase is in the middle of the house; you can walk around it. When you come in the front door and go left, you get to the dining room and then the kitchen. If you go right, you go to the family room and then the kitchen. We never go left. Why not? Because all the light switches for the kitchen are in the family room. So if it’s dark and I forget I have to walk through the kitchen to get to the lights. However, the laundry room takes the cake: it’s a room that is no bigger than the span of my arms yet there are two light switches for the overhead light. So I can, in theory, stretch out my arms and turn the light on with my right and off with my left at the same time. Even after 5 years in this house I still chuckle every time I go in there. It’s like a fun party game; that and sliding down the stairs in a plastic bin, which I have yet to do but I really, really want too. Until I get up the nerve to do that, I’ll just stuff my face with these babies. These Apple Toffee Bars are sort of like a cookie, but in bar form. With frosting. Brown sugar frosting. And toffee. Oh, and apple, of course. Sinfully sweet, and healthy enough for breakfast because there is fruit in them. Right? These cookie bars are probably the easiest ones you’ll ever make because they start with prepared sugar cookie dough. Now, you could use my favorite sugar cookie recipe if you don’t want to use the cookie dough roll from the grocery store. You can even use a box mix (like Krusteaz or similar). Really, the sugar cookie dough is just the vehicle for all the apple and toffee goodness that happens after. Granny Smith apples are diced and mixed into the dough, giving the sweet cookie some tartness. 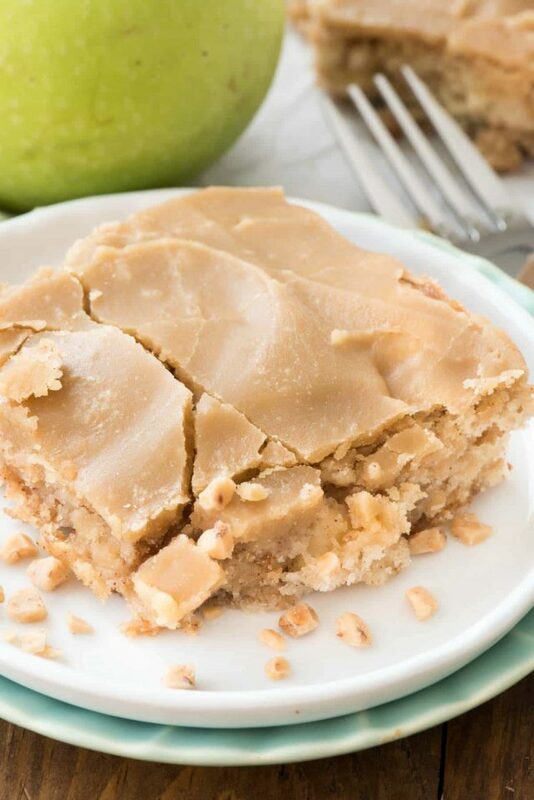 You can use any kind of apple, but there is a lot of sugar in this cookie bar so the extra tart green apple is perfect for this recipe. Adding toffee bits takes this easy cookie recipe to another level. 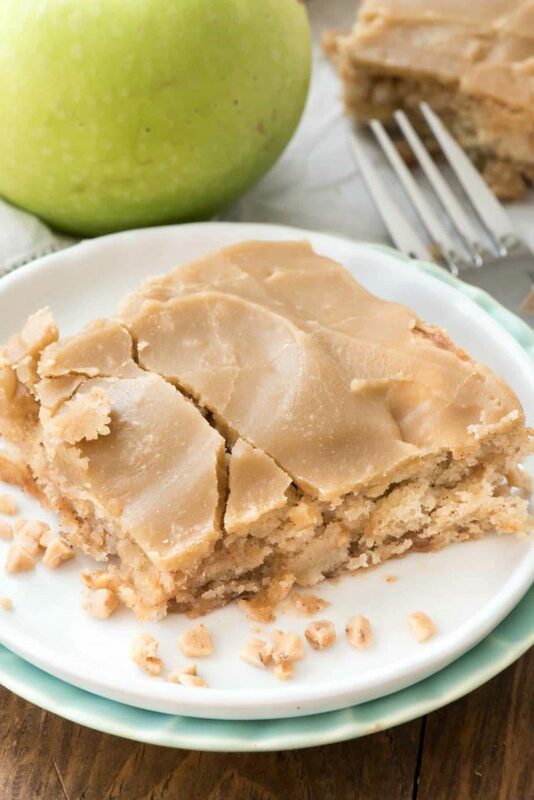 Apple Toffee Bars are the perfect fall dessert: a sugar cookie bar full of apples and toffee and covered with an easy rich brown sugar frosting. These Apple Toffee Bars are thick and gooey and rich. They’ll feed a crowd too since a small slice is all you need! Wait until the bars are completely cool before pouring on the frosting. They’ll hold up better that way; as you can see from my photos I didn’t wait! Either way they taste good but waiting makes them more of a bar and not waiting make them more of a fork dessert. These bars are good with or without the frosting. Cooking the frosting too much makes it more crumbly, so be sure to remove it from the heat right after it boils. It’ll set quickly, so be sure to pour it immediately over the cooled bars. If you love apple and toffee together as much as I do, be sure to check out Toffee Apple Eclair Cake by Lemons for Lulu, Sticky Toffee Pudding Apple Pie by Saving Room for Dessert, and Toffee Apple Dip by Wishes and Dishes. Preheat oven to 350°F. Line a 9x9" pan with foil and spray with nonstick cooking spray. Break up cookie dough in a large bowl. Stir in apples, cinnamon, and toffee. You may need to use your hands to get it completely mixed. Press dough into prepared pan. Bake 20-30 minutes or until the cookies are browned and cooked through. Cool completely before making frosting. To make the frosting: heat butter in a small saucepan over medium low heat. Add the brown sugar and milk and cook until the mixture boils. Remove it from the heat and stir in the powdered sugar and vanilla. Pour immediately over cooled bars. Let set, then cut and serve. Yes! Finally someone writes about wow gold quickly. Boiled frosting is THE BEST! I love any kind of frosting that’s been boiled. It has an old-fashioned, like my grandma made it, kind of taste which I adore. These bars? I would have skipped cake for these babies! My jam right here! How would i adjust this recipe up to a 9×13 size pan? Im taking it for a crowd of serious dessert eaters! Your blog is a delight to read & the recipes are always delicious and easy to make. This would be so good, but, must be kept in the refrigerator. Who has room for a big ole cake in your frig? This looks delicious and I would love to try. I sometimes love shortcuts but prefer to bake from scratch. If making my own sugar cookie base, would you put the whole batch in the 9×9 pan? Seems like it would be too much and then the ratio of apples to cookie base would be off. Have you used your perfect sugar cookie recipe as a base for this?